To produce the words for text or speech, British physicist Stephen Hawking currently uses an infrared sensor mounted on his eyeglasses, visible here during an appearance this month in Seattle. The sensor picks up twitches from his cheek, which are translated into the desired letters or words. Hawking and neuroscientist Philip Low are experimenting with a system that can translate brain waves directly into text and speech. After months of tweaking, researchers are finally ready to show off a high-tech headband that can translate Stephen Hawking's brain waves into speech — providing what could eventually become an easier avenue for the paralyzed British physicist and many others to share their deep thoughts. The system, developed by San Diego-based NeuroVigil and known as iBrain, uses a head-mounted receiver the size of a matchbox to pick up different types of brain waves. iBrain employs a computer algorithm called SPEARS to analyze the brain emanations and encode them for a text-based speech reader. Philip Low, NeuroVigil's founder, chairman and CEO, is to present the latest results from his work with Hawking on July 7 at a Cambridge conference on consciousness. "I haven't discussed doing a demonstration with Stephen, but we could do that, of course," Low told me today. During the conference, Low will be showing video clips of Hawking using the iBrain to communicate. 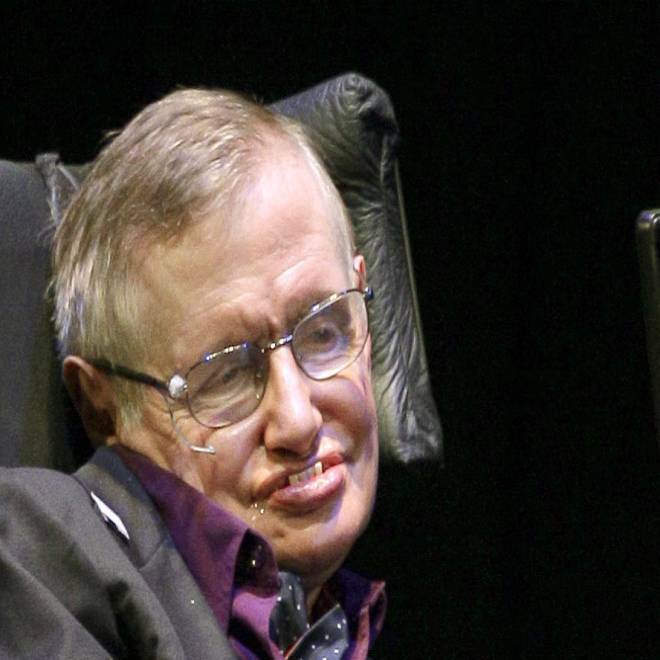 For decades, Hawking has been coping with amyotrophic lateral sclerosis, a degenerative nerve disease that has left the theoretical physicist confined to a wheelchair and unable to move even his fingers. To write or speak, he currently uses an infrared sensor system mounted on his eyeglasses: His cheek twitches are read by the sensor to control a wheelchair-mounted computer system that slowly encodes the patterns of those twitches. It can take a half-hour for Hawking to twitch out a couple of sentences in response to a question. In an abstract prepared for next month's presentation, Low and Hawking describe how they worked out their technique for the iBrain system. Hawking (who is described as a "high-functioning 70-year-old ALS patient" in the abstract) was told to try moving one of his hands or feet — for example, flexing his foot or scrunching his hand into a ball. The limbs didn't move, of course, but just thinking about trying to move them generated readable brain-wave patterns. "The subject's brain activity demonstrated distinct broad-spectrum pulses extending to the gamma and ultra-high gamma ranges," the researchers wrote. "Such pulses were present in the absence of actual movement, and absent when the subject was not attempting motion." The abstract said Hawking's brain also buzzed with alpha brain waves when he closed his eyes, as expected. Alpha waves are associated with wakeful relaxation, and are probably familiar to anyone who's undergone biofeedback training. Gamma waves, in contrast, are associated with increased attention — and in the past have been linked to activities ranging from running to learning. The fact that Hawking's brain signals could be read reliably is a good sign, not only for one of the world's best-known scientists but for hundreds of thousands of others around the world. Low and Hawking say their work "opens the possibility to link intended movements to a library of words and convert them into speech, thus providing ALS sufferers with communication tools more dependent on the brain than on the body." Low told me that the brainwave-reading device could be used to control prosthetic devices "to give ALS sufferers mobility" — sort of like a real-life version of the Stephen Hawking robotic exoskeleton proposed in an Onion parody 15 years ago. The iBrain device could have other applications, such as diagnosing sleep apnea, studying autism and monitoring other brain conditions. It's already been used in a clinical trial to monitor the effects of experimental drugs on brain activity. The U.S. military is also looking into how the device can help treat traumatic brain injury and post-traumatic stress disorder, which are big issues for combat veterans. Direct brain-to-speech communication, however, represents the highest-profile application, particularly when Stephen Hawking is involved. "We'd like to find a way to bypass his body, pretty much hack his brain," The Telegraph quoted Low as saying. The key question for Hawking is whether iBrain represents an improvement over the system he currently has. Back in April, the professor told The New York Times that the project hadn't quite reached that point. "At the moment I think my cheek switch is faster ... but should the position change I will try Philip Low's system," he wrote in an email sent by an assistant. In that quote, Low said Hawking was talking about brain-computer interfaces in general, rather than specifically about iBrain. "What we are seeing is in fact an immediate response, so the question is going to be to productize this, so that he can communicate reliably should he lose control of his cheek muscles," he said. Neuroscientist Philip Low (at right) demonstrates how the iBrain device can send brain-wave readings to a cellphone with an subject who's wearing the headband (at left) during a TEDMED 2009 presentation. Click on the image to watch the YouTube clip. Low said the iBrain project was already moving on to Version 2.0, and the iBrain 3 device is due to be built next year. "That will be about the size of a U.S. quarter," he told me. "People will be able to check their brain activity much like you or I can check our blood pressure." The 32-year-old, Vienna-born researcher's company has come a long way since its founding, which Low says he initially financed by putting $240,000 on his credit card. Someday, he hopes brain-monitoring systems will be used to pick up the signs of neurological problems early enough to do something about them. For Low, this is not just business. It's personal. "I would have loved to see this 20 years ago, when my father suffered from a side effect of a commonly used sleep drug," he told me. "He threatened someone with a weapon ... a gun, actually. And it destroyed our family." His father was eventually pardoned, but it took a long time to put everything back together. That experience led Low to look into the neurological basis of sleep, including experiments with bird brains. That was what led him to come up with the SPEARS algorithm in the first place. "It's very ironic that an algorithm I initially developed to analyze the brain patterns of birds has found its way to dealing with Stephen Hawking's brain patterns, the U.S. military and autistic children," he told me.